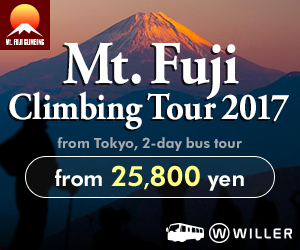 Highlights and how to get to Jingo-ji Temple. 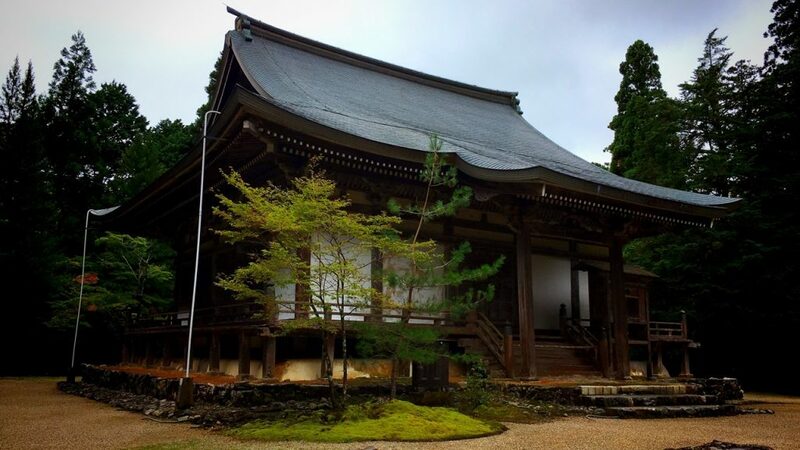 Jingo-ji Temple is the successor of the Koyasan Shingon Sect head temple located in Takao, Ukyo Ward, Kyoto City. 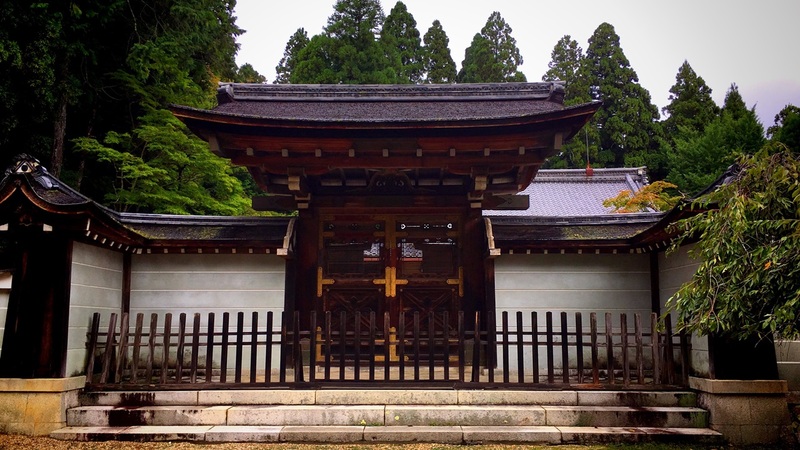 This temple is the successor head temple of the Koyasan Shingon Sect in which Kobo-Daishi Kukai used to reside in the old days. 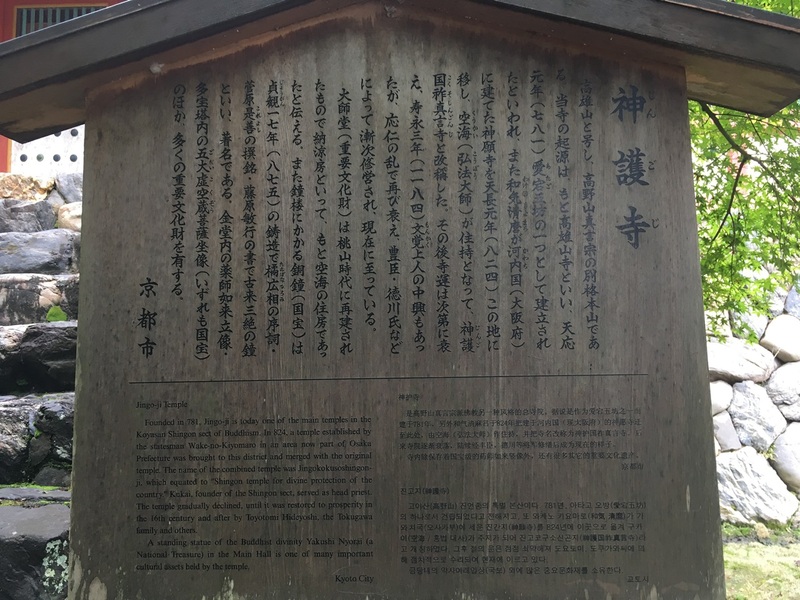 In addition, it is said that Saicho which is an initiator of the Tendai sect also preached the teaching of the Lotus Sutra in this temple a moment of time in the past. Exactly!! 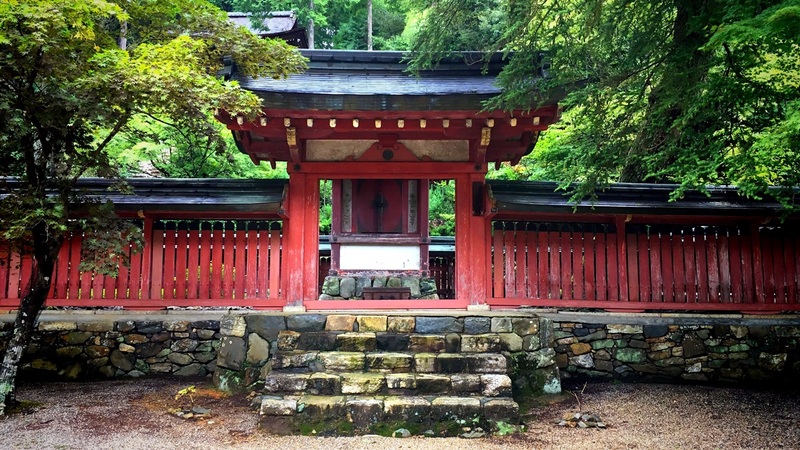 In fact, this temple played an important role in Japanese history of Buddhism. By the way, one of the Japanese old custom is the play which is called “Kawarake Nage(Pottery throwing)“. “Kawarake Nage” refers to throwing an unglazed or sunbaked earthen sake cup or dish from a high place, wishing protection from evil and so on. 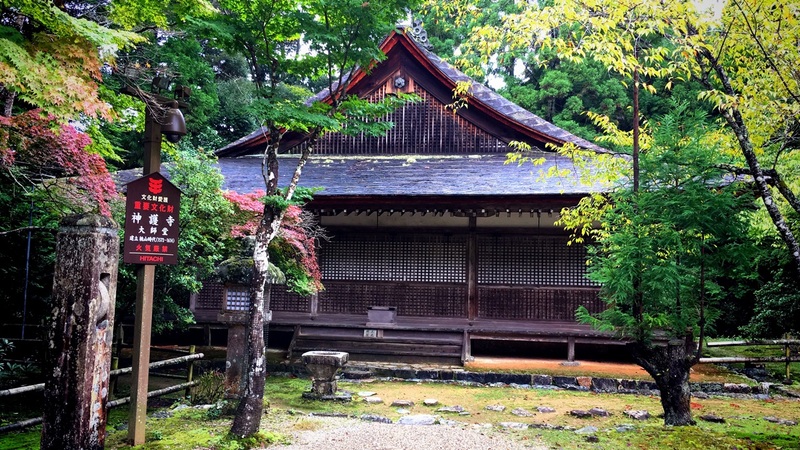 As for the “Kawarake Nage”, Jingo-ji Temple is regarded as its birthplace. Along with Saimyo-ji Temple(西明寺) and Kosan-ji Temple(高山寺), this temple is one of the “三尾の名刹(Three famous temple in northwest of Kyoto)”. 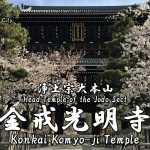 These temples are located within walking distance from each temples. Jingo-ji (神護寺) is a Buddhist temple in Kyoto. 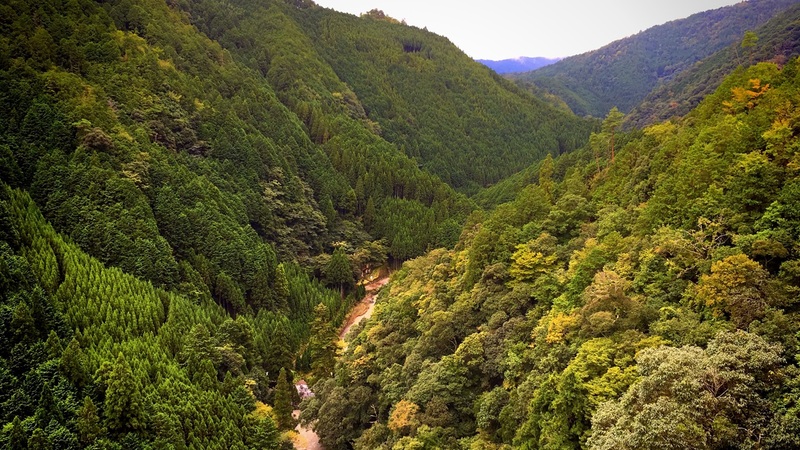 It stands on Mount Takao to the northwest of the center of the city. 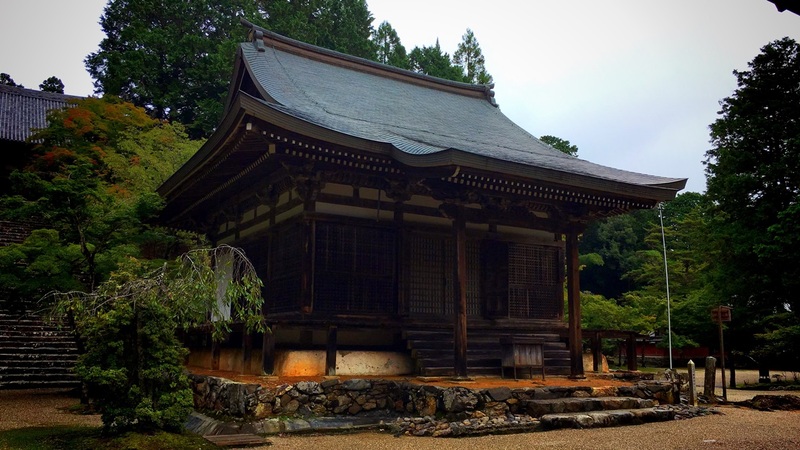 The temple adheres to Shingon Buddhism. Its gohonzon is a statue of Bhaisajyaguru (Yakushi Nyoōrai), the Buddha of Healing or “Medicine Buddha”. 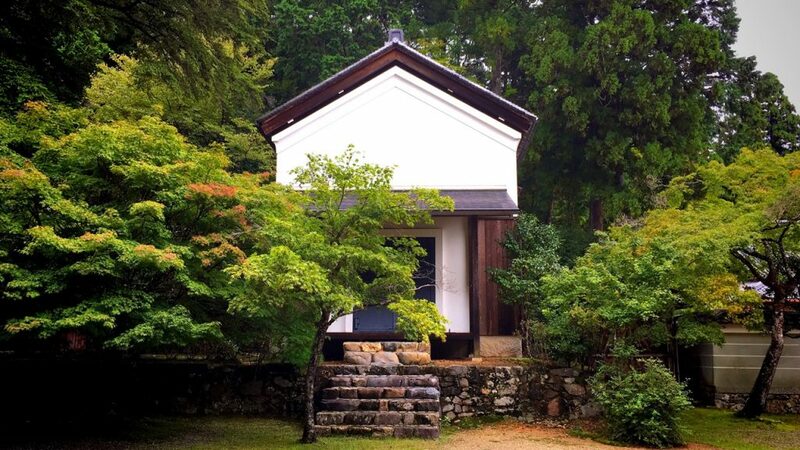 The temple was established in the year 824, as a merger of two private temples founded earlier by Wake no Kiyomaro. They were the Jingan-ji (神願寺) in Kiyomaro’s home province and the Takaosan-ji (高雄山寺). 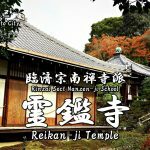 The official name of this temple is ”神護国祚真言寺(Jingokokuso-Shingon-ji Temple)”, and the popular name is “神護寺(Jingo-ji Temple)”. 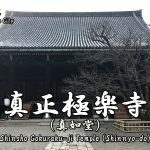 The name ‘Jingokokuso-Shingon-ji Temple’ means ‘Shingon Sect temple that prays for the spiritual protection of the nation by the divine protection of Hachiman’ and clearly distinguishes it as an Esoteric Buddhist temple. This is the precincts guide map of Jingo-ji Temple. 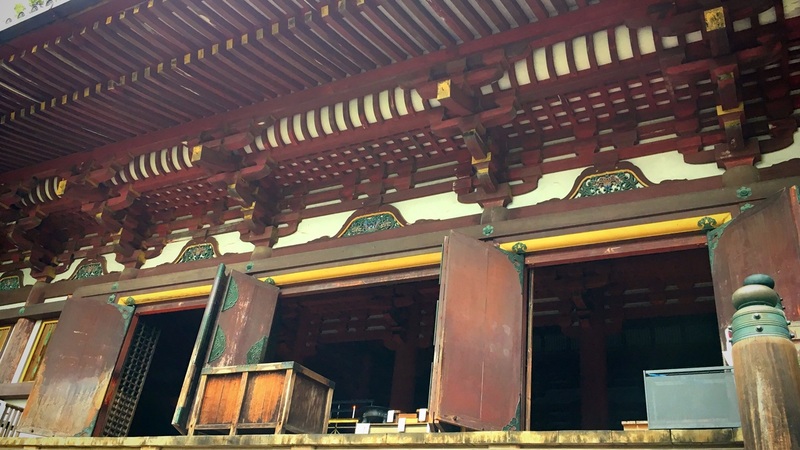 The precincts of Jingo-ji Temple are very large. 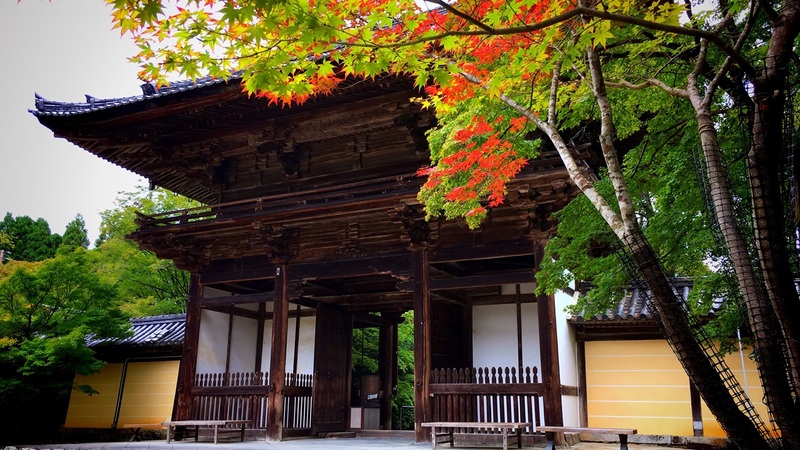 Jingo-ji Temple is known as a place of turning autumn-red earliest in Kyoto. 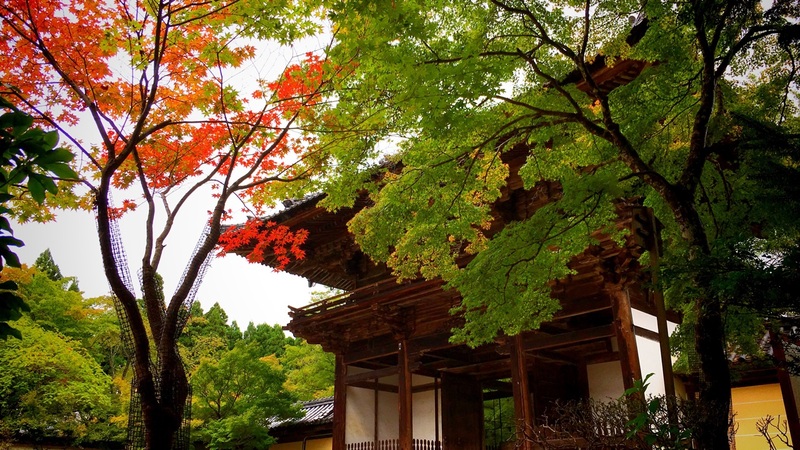 The best time to see the colored leaves of this temple is from the end of October to November every year. This is the Takao Bridge(高雄橋). 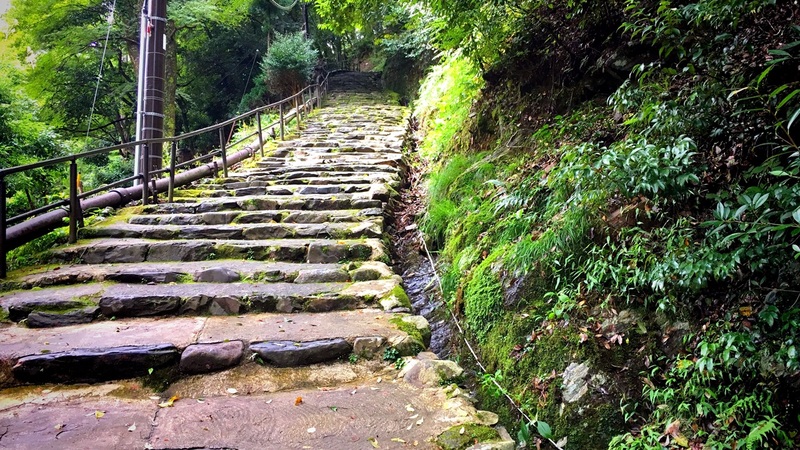 All temple buildings are situated in the mountains at the end of a long path beginning at this bridge that spans the Kiyotaki-gawa River. 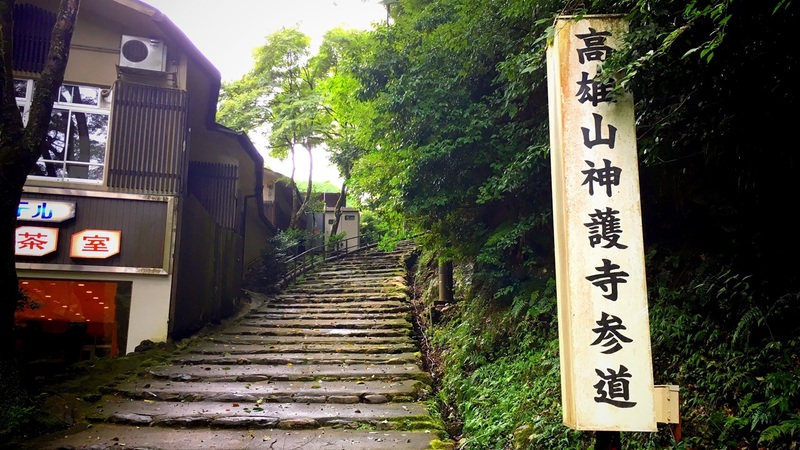 This is the entrance of the approach to a temple of Jingo-ji Temple. 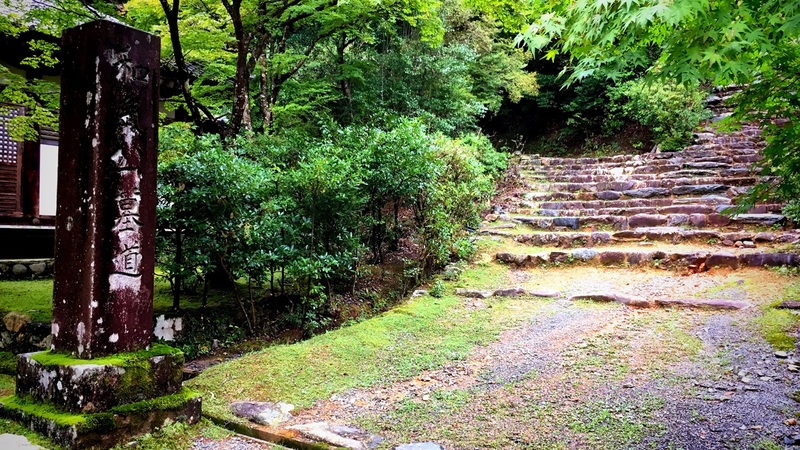 We must go up the steep stairs from here to the main gate of a temple. Let’s do our best…!! 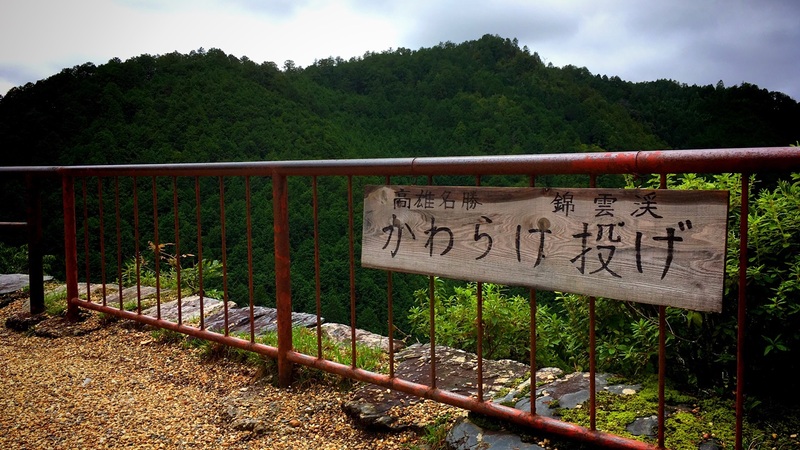 We can see the 楼門(Romon Gate) when we finished going up the slope. This gate was built in 1623. “持国天(Jikokuten : White Guardian of the East)” is enshrined on the left side, and “増長天(Zochoten : White Guardian of the South)” is enshrined on the right side of this gate. These are a war god and one of the Shitenno (the Four Guardian Kings) in the Buddhism. There is an entrance of the 本坊(Hombo) beside the 楼門(Romon Gate). 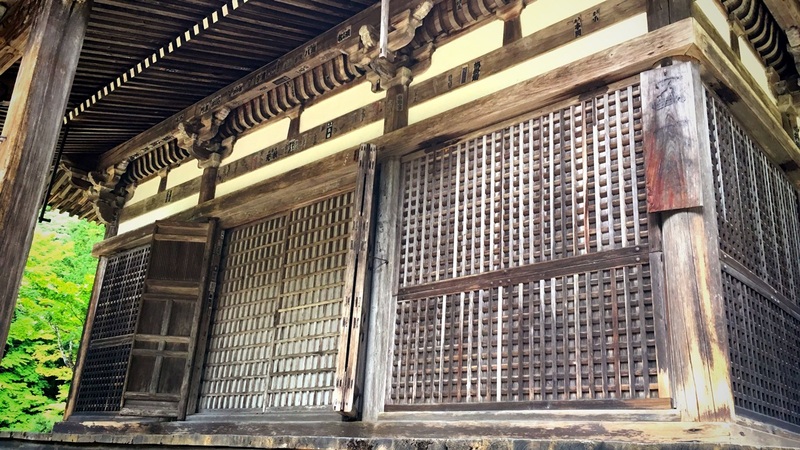 Inside of the 本坊(Honbo) is not open to the public. 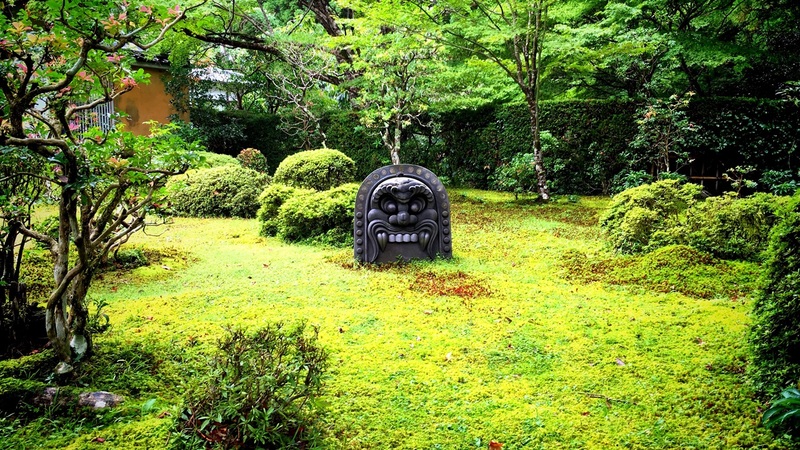 A lot of Oni-gawara(the tile which shaped the face of the ogre) are displayed in the garden of the 本坊(Honbo). 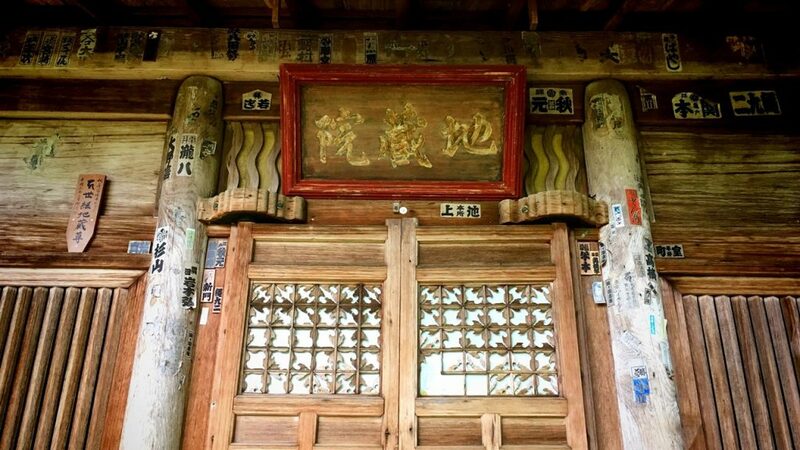 Since ancient times, this tile has been believed to have the power to purge evil spirits. 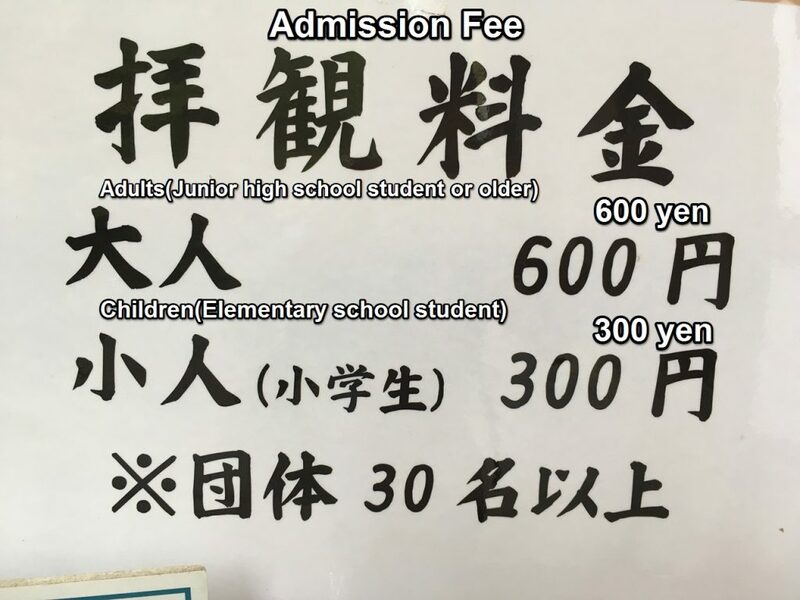 An admission fee is 600 yen (adults). 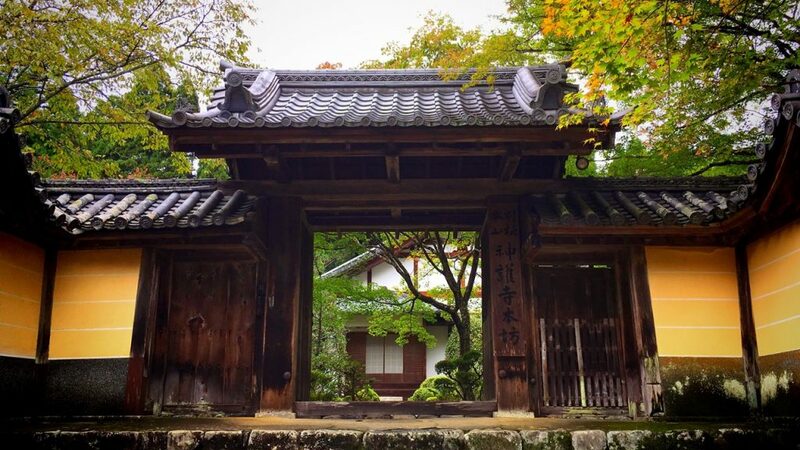 This is the 楼門(Romon Gate) to see from the precincts of the temple. 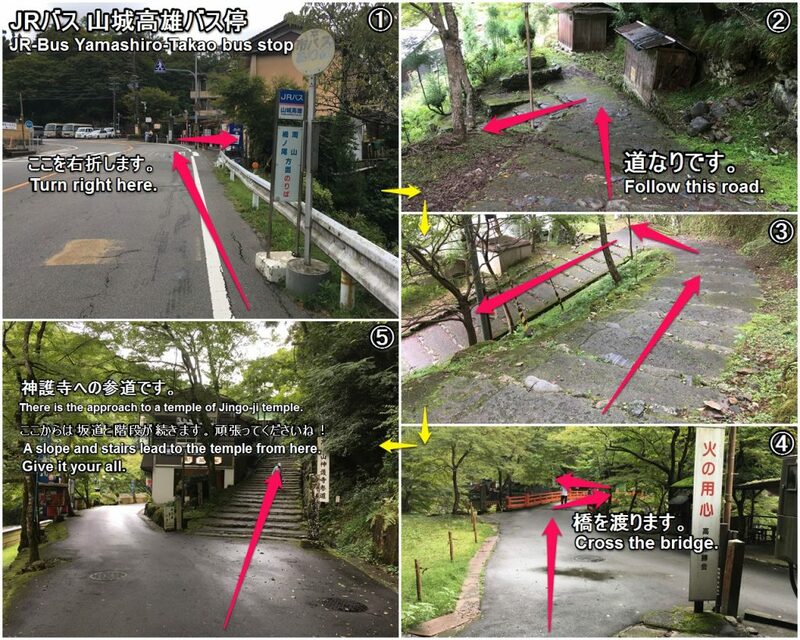 An approach to a temple spreads out. This is the 唐門(Karamon Gate (Chinese-style gate)). 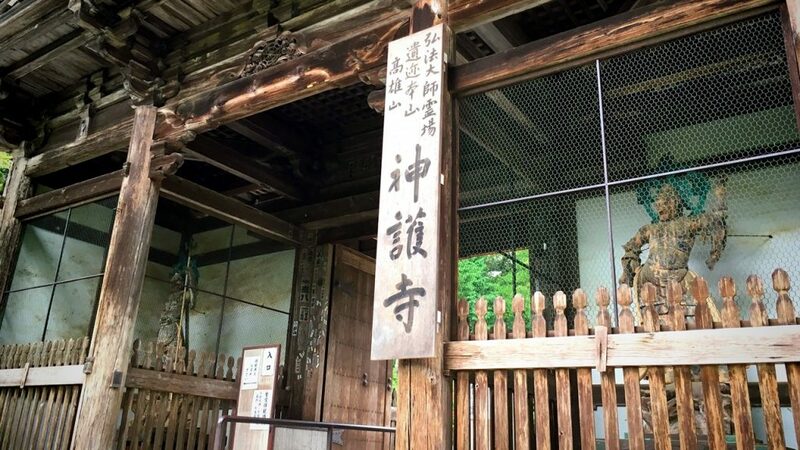 There is the 書院(Shoin) inside of this gate. 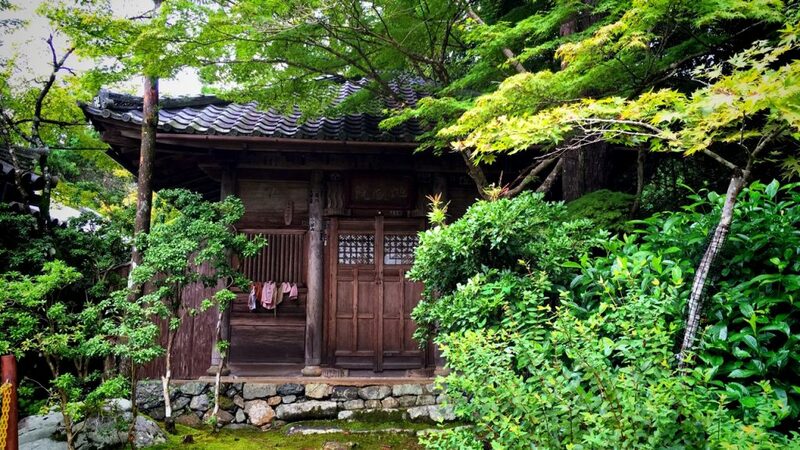 This is the 宝蔵(Treasure house). 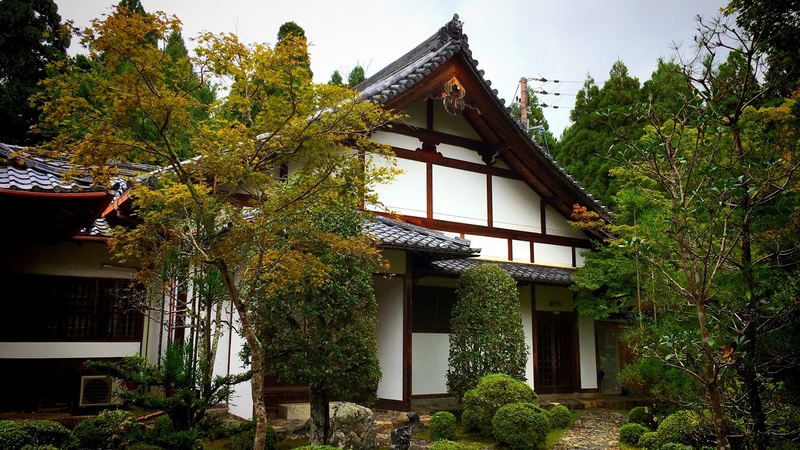 In this treasure house, 17 national treasures and many artworks are kept. The national treasure which is the most famous of this temple is this portrait. 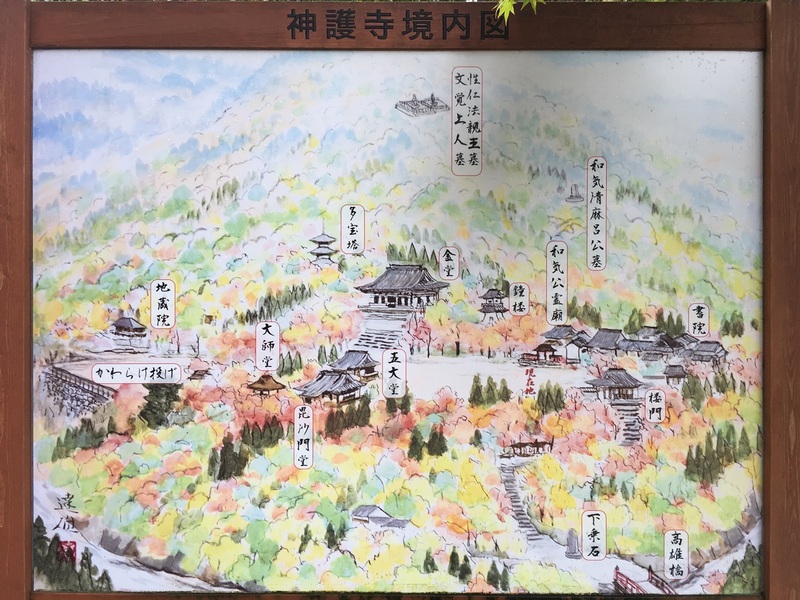 The national treasure which is the most famous of this temple is the 絹本著色伝源頼朝像(MINAMOTO no Yoritomo’s portrait which was drawn by color painting on silk.). 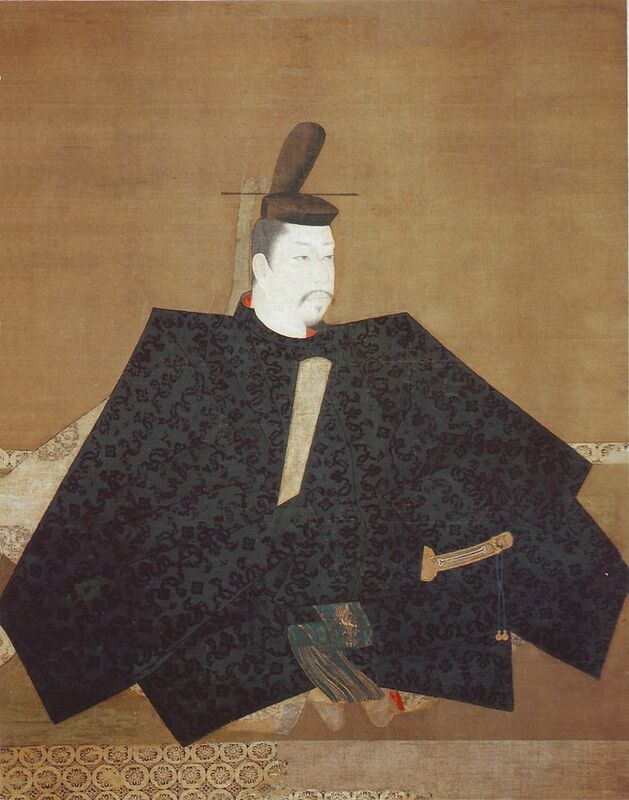 Because this portrait is always published in the textbook of the Japanese history, every Japanese knows this portrait. This is the 和気公霊廟(Mausoleum of WAKE no Kiyomaro). 和気清麻呂公(WAKE no Kiyomaro) is an initiator of this temple. 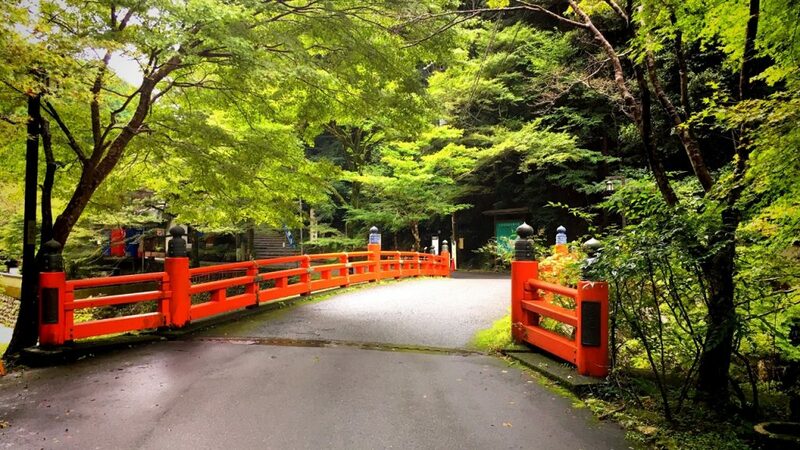 There was the 護王神社(Goo-jinja Shrine) which enshrined 和気清麻呂公(WAKE no Kiyomaro) many years ago. This is the 鐘楼(bell tower). It was rebuilt in 1623. 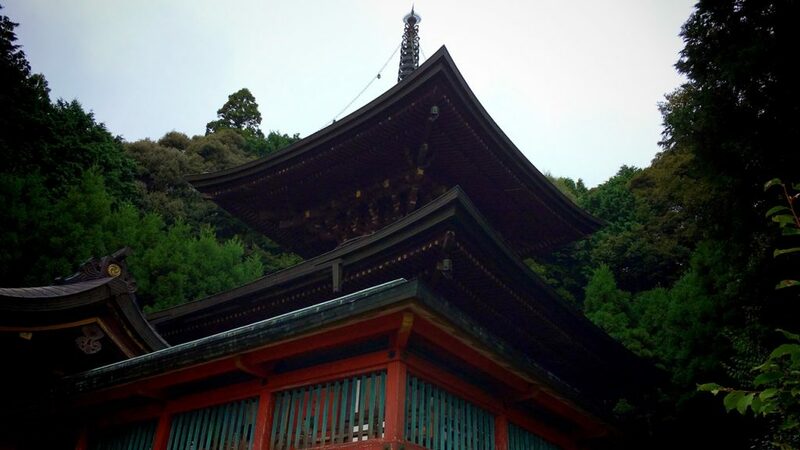 In this bell tower, there is a temple bell called “三絶の鐘(Sanzetsu no kane)”. 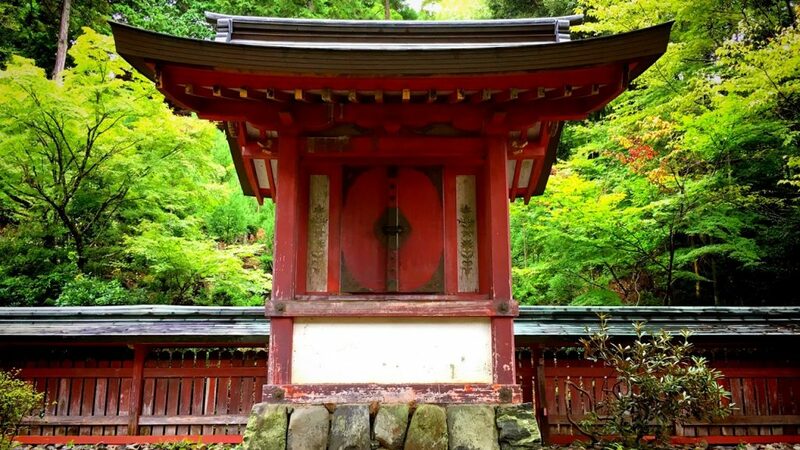 This temple bell was made in the year 875, and has been designated as a national treasure. 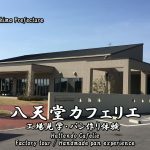 This is the 明王堂(Myoo-do Hall). 不動明王(Fudo Myoo(Acala, one of the five Wisdom Kings)) is enshrined in this building. There is a mountain path following the grave of 和気清麻呂公(WAKE no Kiyomaro) in the neighbor of this building. This is the 毘沙門堂(Bishamon-do Hall). This was built in 1623. 毘沙門天立像(A standing statue of Bishamonten (Vaisravana)) of the important cultural property which was made in Heian era is enshrined in this building. This is the 大師堂(Daishi-do (Great Priest’s Hall)). 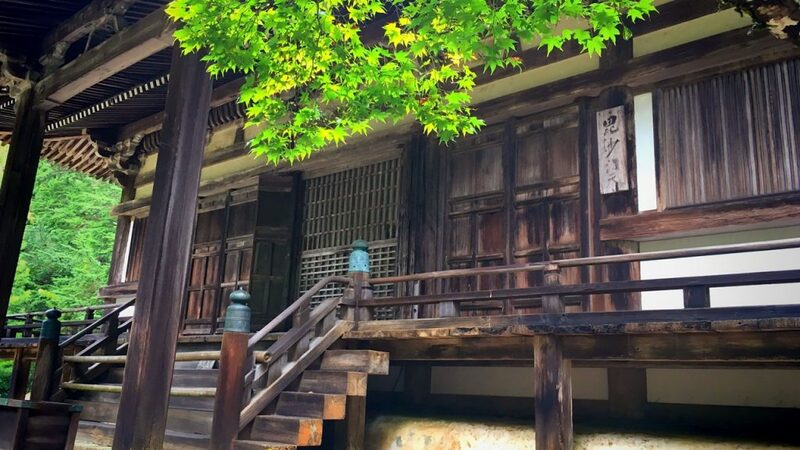 This building is an important cultural property of a country rebuilt in Momoyama era. This building rebuilt a building called “納涼房(Noryo-bo)” which was a house of 空海(Kukai). 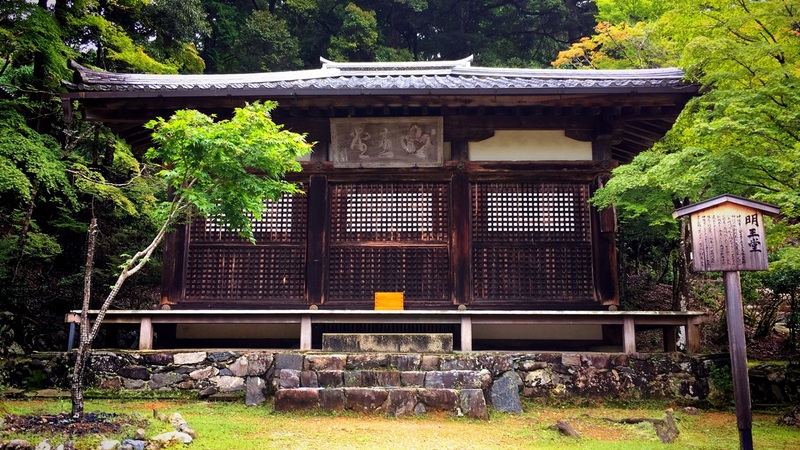 板彫弘法大師像(Openwork engraved portrait of High Monk Kobo) of the important cultural property is enshrined in this building. This is the 五大堂(Godai-do Hall). 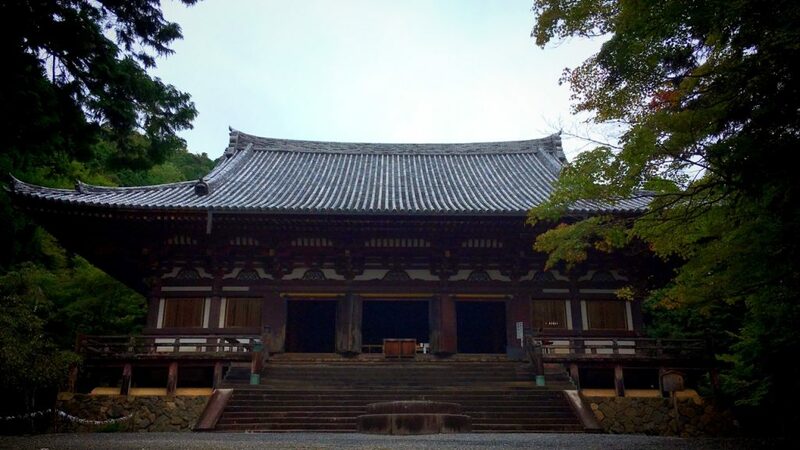 五大明王(Godai Myoo (Five Great Myoo)) is enshrined in this building. 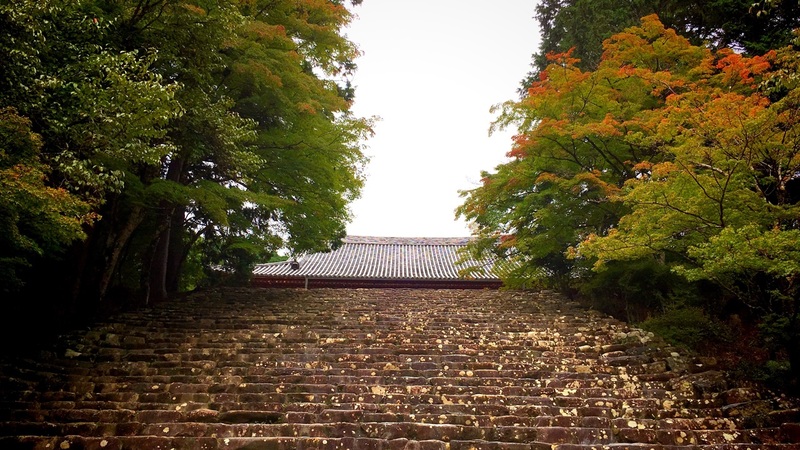 A lot of maple trees are planted at the both ends of stairs spreading out to the 金堂(Kondo (Main Hall)). 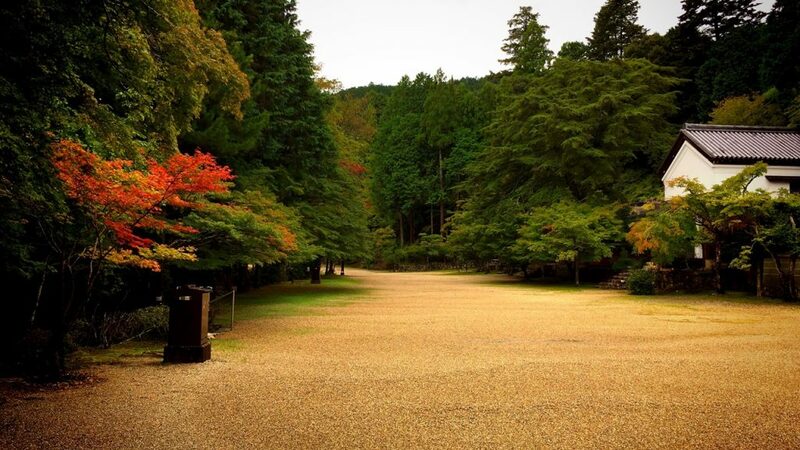 This place is a famous photography place of the time of colored leaves. 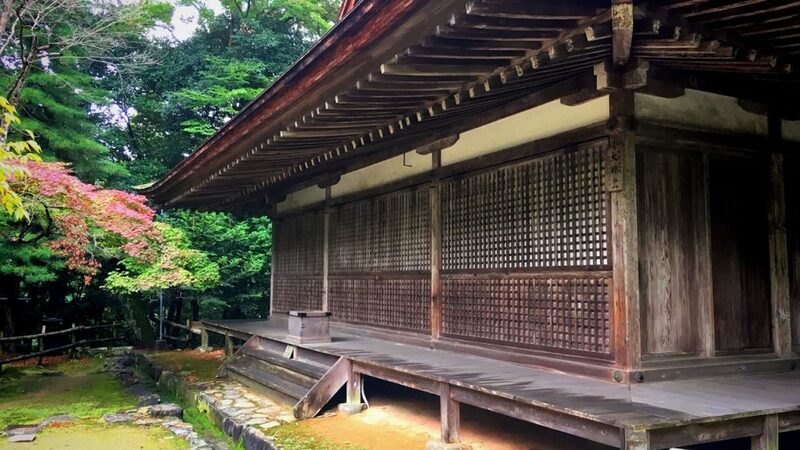 This is the 金堂(Kondo (Main Hall)). This is a relatively new building which was built in 1934. 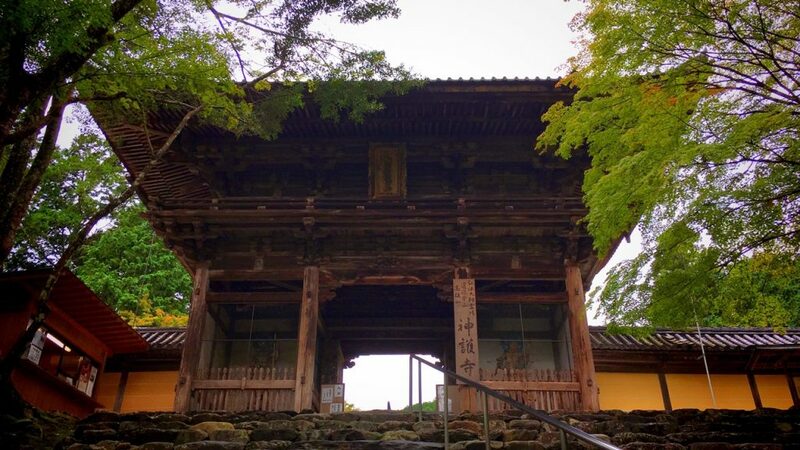 The image of Yakushi Nyorai (Healing Buddha) of the national treasure and other images are enshrined in this building. 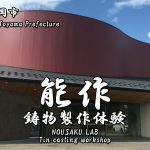 Photography and video recording are prohibited in the 金堂(Kondo (Main Hall)). 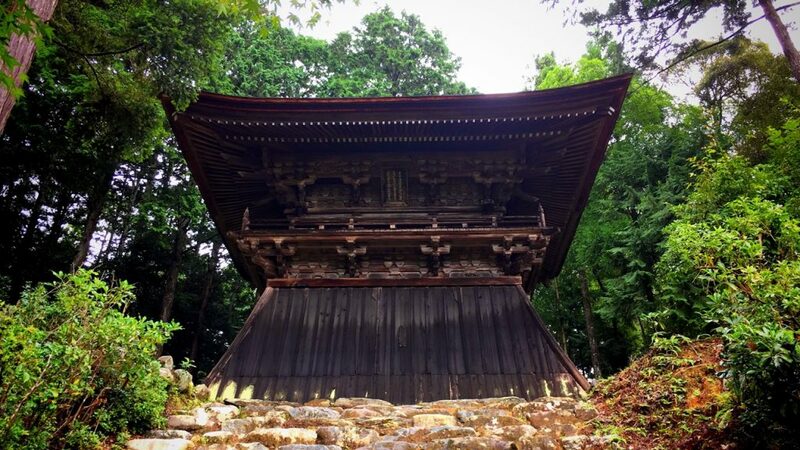 This is the 多宝塔(Tahoto(a multi-treasure pagoda)). This tower is also a relatively new building which was built in 1934. Statues of the Godai Kokuzo Bosatsu (Five Great Akasagarbha), which are national treasures, are enshrined in this pagoda. 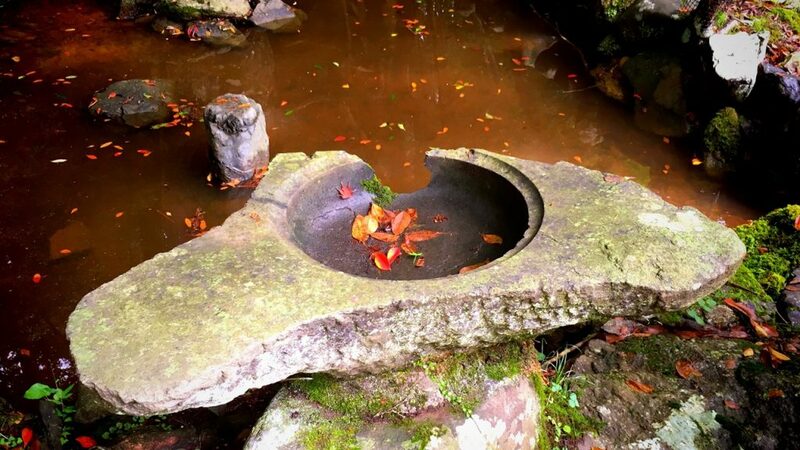 There is a well which is called “閼伽井(Akai)” near of the 金堂(Kondo (Main Hall)). 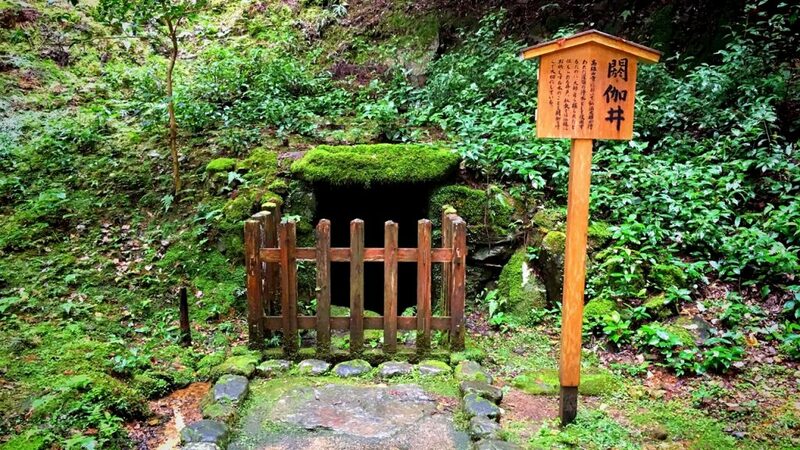 It is said that this well was dug for a ceremony of the esoteric Buddhism called “灌頂(Kanjo : Consecration for the Transmission of the Dharma)“. 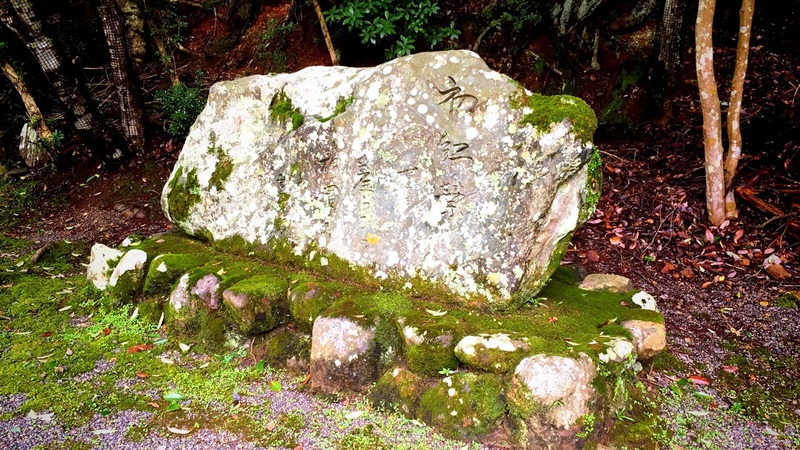 This is the monument inscribed with a poem which was composed by 能村登四郎(Toshiro Nomura). 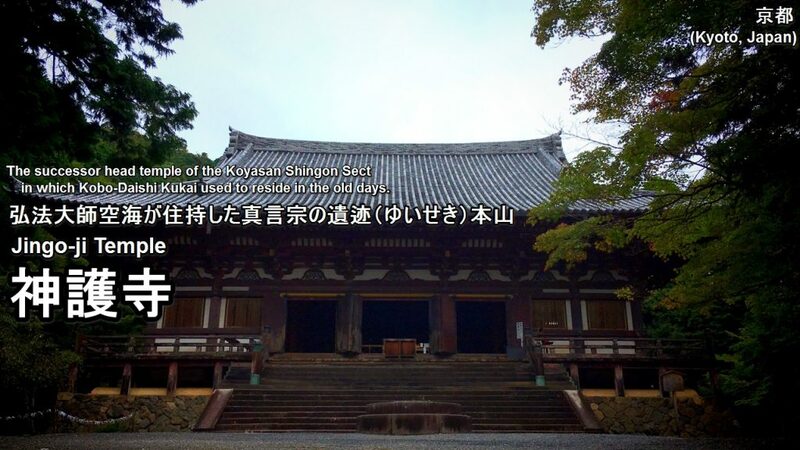 This is the haiku about the first colored leaves. 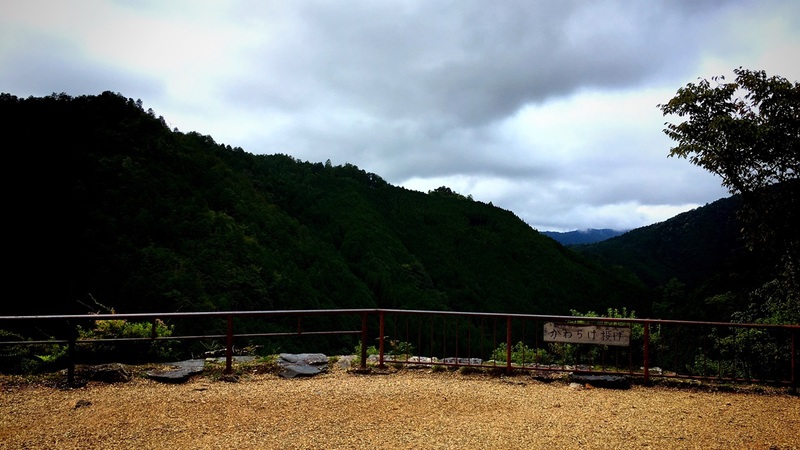 This is the 地蔵院(Jizo-in Temple). This is one of the Tatchu (minor temple in the site of main temple) of Jingo-ji Temple. This building was rebuilt in 1900. One of the Japanese old custom is the play which is called “Kawarake Nage(Pottery throwing)“. “Kawarake Nage(Pottery throwing)” refers to throwing an unglazed or sunbaked earthen sake cup or dish from a high place, wishing protection from evil and so on. There are still some places where you can enjoy “Kawarake Nage(Pottery throwing)” in old tourist sites and temples. 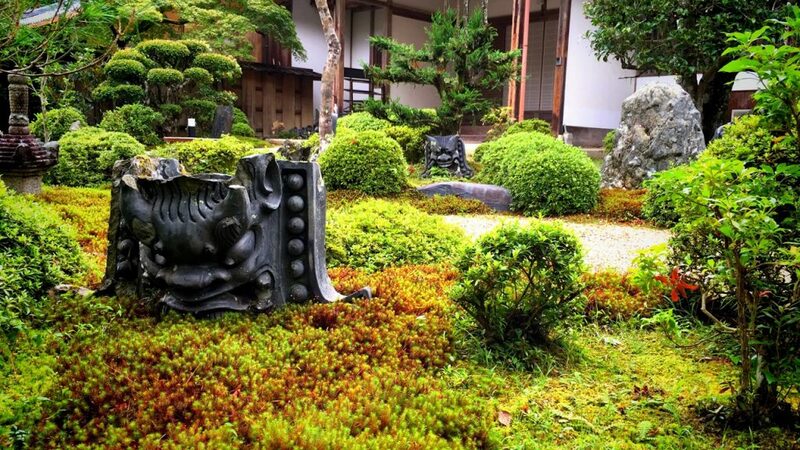 Especially, As for the “Kawarake Nage(Pottery throwing)”, Jingo-ji Temple is regarded as its birthplace. 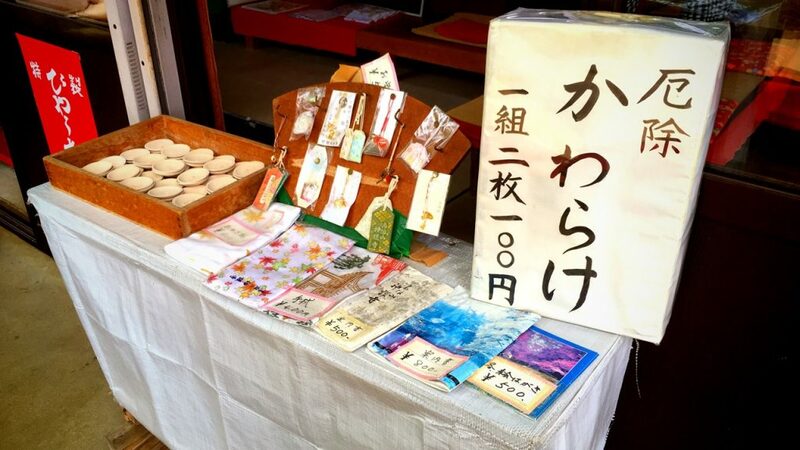 Let’s purchase the tile(Kawarake) at the shop of this temple. The price is 100 yen / two. Let’s throw a tile with all your might from this place!! There is divine favor by throwing a tile with all your might. Ravine spreads out outside the fence. “Kawarake Nage(Pottery throwing)” of other places has a target like the mark to hit a tile, but there is no such a target here. Throw a tile with all your might!! It’s only that. 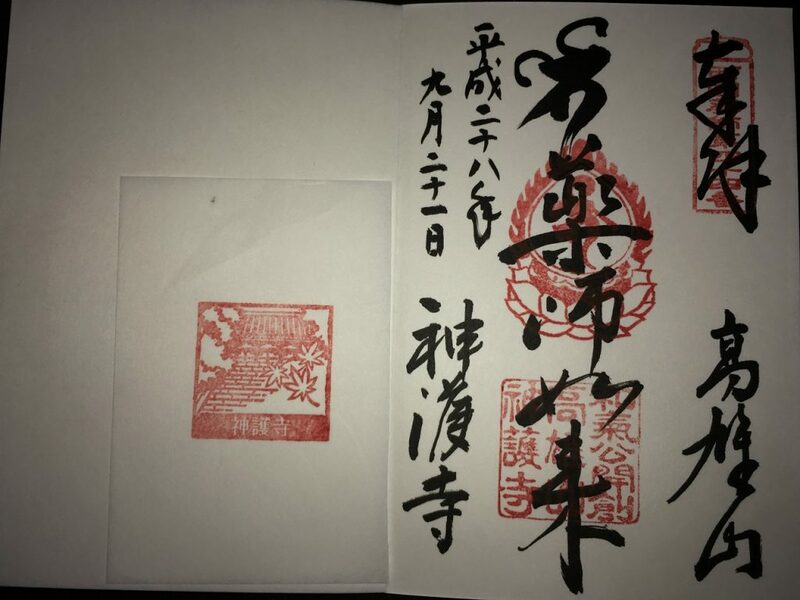 The word which can read as “薬師如来(Yakushi Nyorai)” is written to goshuin with a sumi. 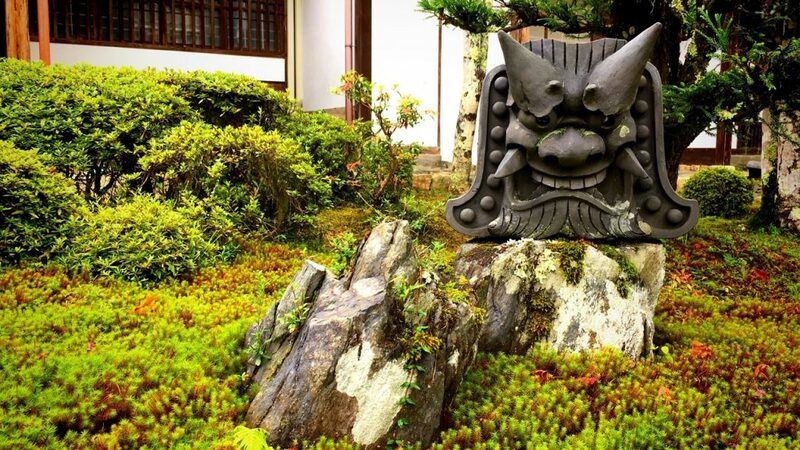 “薬師如来(Yakushi Nyorai)” is a principal idol of this temple. There is no station of the train in the neighborhood of Jingo-ji Temple. 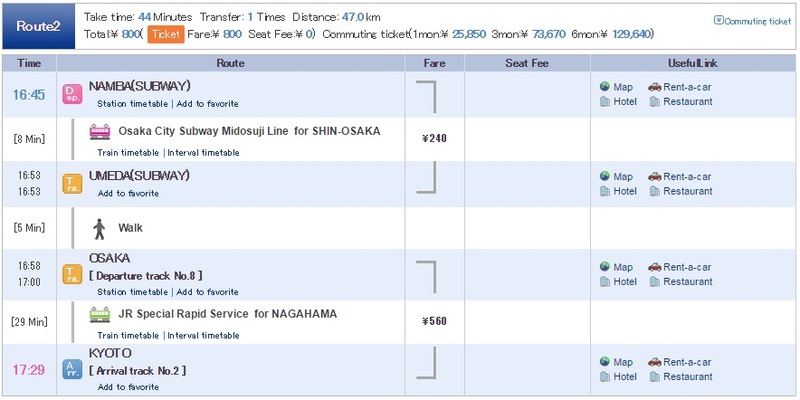 Thus, we need to use the bus or the taxi to get to Jingo-ji Temple. 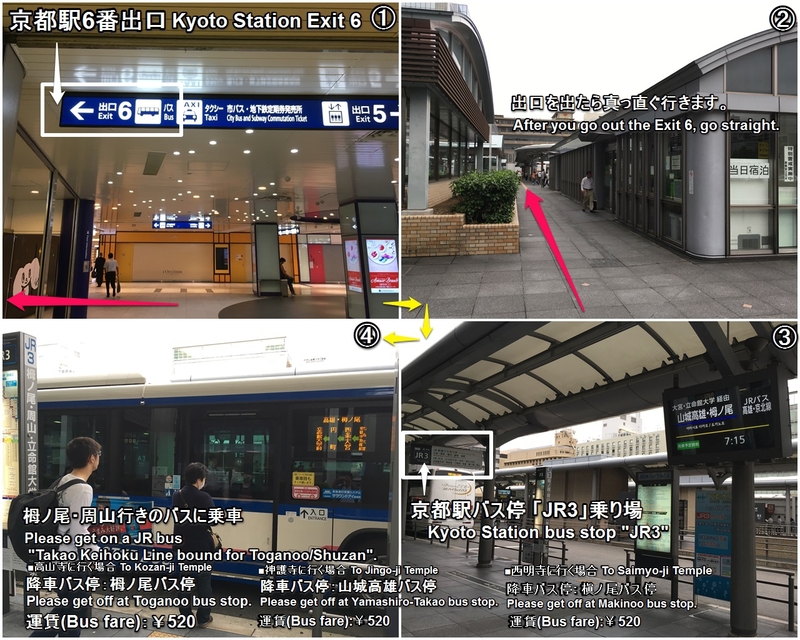 The simplest way get on JR bus from “Kyoto Station”. 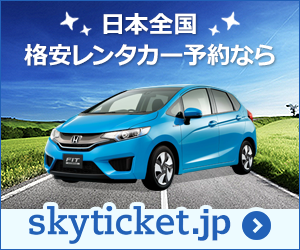 The nearest bus stop is Yamashiro Takao bus stop. Yamashiro Takao bus stop, JR-Bus “Takao Keihoku line” bound for Kyoto Sta. 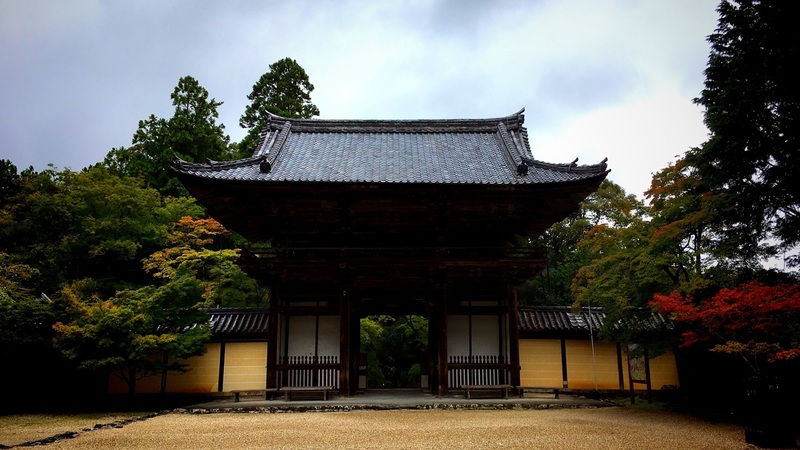 Along with Saimyo-ji Temple(西明寺) and Kozan-ji Temple(高山寺), this temple is one of the “三尾の名刹(Three famous temple in northwest of Kyoto)”. By all means, everyone please try and go.